Football fans get ready – The World Cup 2014 is almost here! To celebrate this international sporting event, Viaden Software released the Football Cup Slot, a brilliant 3D Video Slot dedicated to this beloved sport. So whether you call it football or soccer, gear up for the exciting Football Cup Slot bonuses and more. 2014 marks the return of the World Cup, but you don’t have to fly all the way to Brazil to get a piece of the action. 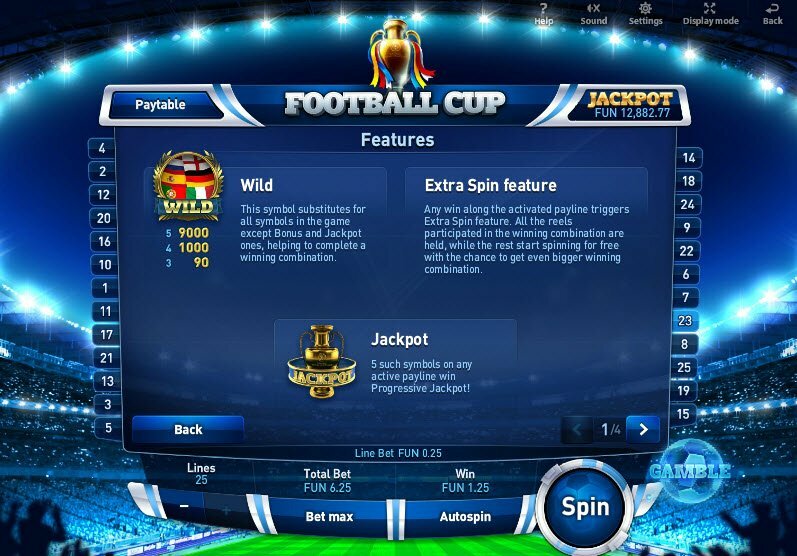 Powered by Viaden software Football cup slot contains 25 paylines and plenty of bonus features to keep any player satisfied. The frequent payouts and well-designed game make this a perfect way to celebrate the upcoming World Cup, or for any fan of the sport to enjoy. 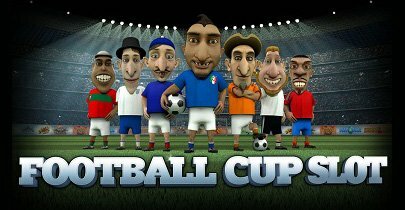 Viaden powers the Football Cup Slot software packed full of outstanding 3D graphics that run seamlessly during gameplay. The Football Cup slot machine perfectly captures the theme with the teams’ flags, football cleats, trophies, whistles, and adoring fans cheering in the background. The reels contain goofy looking football players representing different countries. Their funny looking faces give a little comic relief to the competition, and honestly, look great. The Football Cup Slot Bonuses come packed with payouts, free spins, wilds, and fun games that make this game not only entertaining, but also rewarding. The Football Cup Slot Bonuses come packed with payouts, free spins, wilds, and fun games that make this game not only entertaining, but also rewarding. Both the Wild and Extra Spin features maximize chances of winning. First of all, the Football Cup Slot Machine’s Wild symbol substitutes for all symbols, except for the Bonus and Jackpot ones. The Wild ends up giving higher chances of landing on a winning combination. The Extra Spin Feature activates after every win. During the Extra Spins, the last two reels spin again awarding a free second chance at winning again. The Football Cup Bonus games include a Gamble Round along with the Lucky Locker bonus. The Gamble Round gives Football Cup slot players a chance to double or quadruple their total bet by guessing where the ball will land in the goal. Players can activate the Gamble Round after every win to test their luck. The Lucky Locker bonus game activates when 3 to 5 bonus symbols appear on the reels. In this game, you open football lockers to reveal different prizes including cash! Now that’s what I’m talking about! Unfortunately, I found it pretty difficult to unlock this special game. Finally, the Football Cup Slot Jackpot gives the chance at cashing in on a huge progressive jackpot pool for lucky players who land on 5 jackpot symbols.